Today, the world mourns the loss of Estelle Getty, best known for her role as the lovable Sophia on the TV show The Golden Girls. 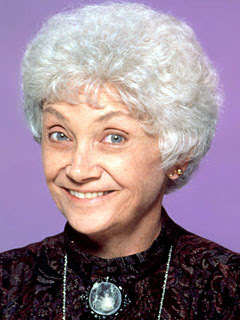 Did you know that Estelle Getty, born Estelle Scher, started out her career in the Yiddish theater? Tune into the Lifetime channel this Friday, July 25th when they air ten of the best episodes of the Golden Girls featuring Sophia. Let's all enjoy one last cheese cake in her honor!